The Fox Grove Inn is nestled on a hillside amidst lush tropical flora. Swiss / St. Lucian owned and managed. Located on the east coast, between Micoud and Dennery, it is surrounded by banana and coconut plantations. There is always a nice breeze from the sea. 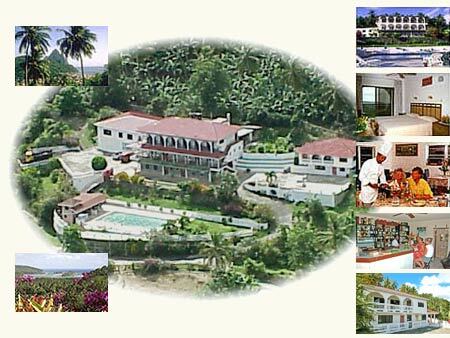 The Fox Grove Inn boasts a magnificent view of Praslin Bay and the Frigate Islands Nature Reserve. Only a 20 minutes drive from the International Airport Hewanorra and the 2nd largest city Vieux Fort and 45 minutes drive to the capital Castries. Self contained villa-apartments with 2 bedrooms/bathrooms, living, kitchen, terrace with a splendid view of Praslin bay and the green surrounding hills.